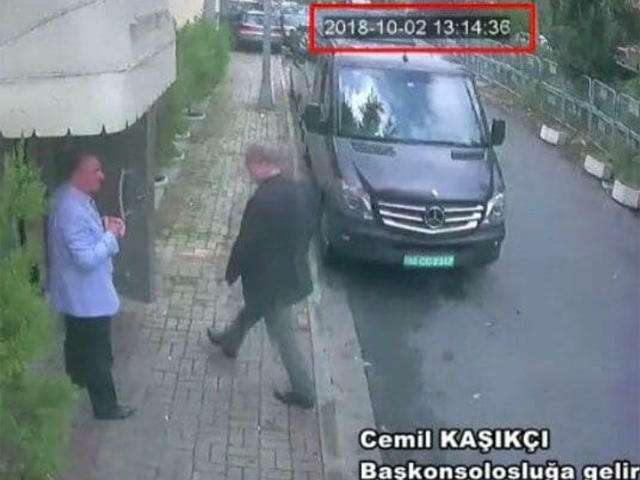 ISTANBUL -- The Washington Post published a surveillance image Tuesday showing its missing Saudi contributor walking into the Saudi Consulate in Istanbul a week ago, just before he disappeared. Turkish officials have said they fear the columnist was killed there, and announced on Tuesday that they would be searching the consulate as part of their ongoing investigation into Khashoggi's disappearance. Saudi Arabia has called the allegations that it killed writer Jamal Khashoggi "baseless," but has offered no evidence over the past seven days to show that he ever left the building. In a statement issued Tuesday, Turkish Foreign Ministry spokesman Hami Aksoy said Saudi authorities had notified Ankara that they were "open to cooperation" and would allow the consulate building to be searched. The ministry did not say when the premises would be searched. Officials in Saudi Arabia did not immediately respond to a request for comment. The image released by the Post bore a time and date stamp. The Post said "a person close to the investigation" shared the image with them. He had been living since last year in the United States, in a self-imposed exile, in part due to the rise of Prince Mohammed, the son of King Salman. The Committee to Protect Journalists (CPJ) has been documenting the increasingly harsh treatment of journalists in Saudi Arabia. It says seven were imprisoned there last year and nine this year. "The worrying trend that we see is a crackdown on critical and independent journalism in Saudi and about Saudi," Robert Mahoney, Deputy Executive Director of CPJ, told CBS News' Pamela Falk. "It is a very repressive place." He said it comes as no surprise that Riyad is looking to quash criticism, but this case is beyond the sad but true usual jailing of journalists. Turkey summoned the Saudi ambassador on Sunday to request the kingdom's "full cooperation" in the investigation, a Foreign Ministry official said. The Turkish private NTV television said Ankara asked for permission for its investigators to search the consulate building, but a Foreign Ministry official would not confirm the report. The officials spoke on condition of anonymity because they were not authorized to talk to reporters about the subject. Ties between Ankara and Riyadh are at a low point over Turkey's support for Qatar in its year-long dispute with Saudi Arabia and other Gulf nations. Turkey sent food to Qatar and deployed troops at its military base there. A Sunni power, Saudi Arabia is also annoyed by Ankara's rapprochement with the kingdom's Shiite archrival, Iran.